Growing fruit trees in containers is an excellent option for many homesteaders, or fruit lovers, of all kinds to grow fruit at home! If you’ve ever dreamed of growing your own fruit but haven’t found the space, then you’re in luck! Here are 7 secrets to getting the fruit orchard of your dream in a small confined space. Fruit trees are such a big hit for homesteaders. Who wouldn’t want free, fresh, delicious fruit growing in their yard? However, folks living in urban areas very rarely have fruit trees due to lack of space. Read along and you’ll learn how to make growing your own fruit possible even with very little space. When choosing a fruit tree, look for dwarf or semi­dwarf varieties. Unlike regular fruit trees, dwarf fruit trees will only grow to be about 8 ft tall. They will also have a thinner main leader stem, meaning they will be less wide. Despite being so small, these trees will produce just as much fruit as a regular tree would, and the fruit will be the same size. When a tree has already been trained to grow in a cone­like shape, it will take up a lot less space when it matures. Cone­like means that the branches grow at a 45-degree angle upwards. Don’t choose a tree that has too many branches growing at 90 degrees. 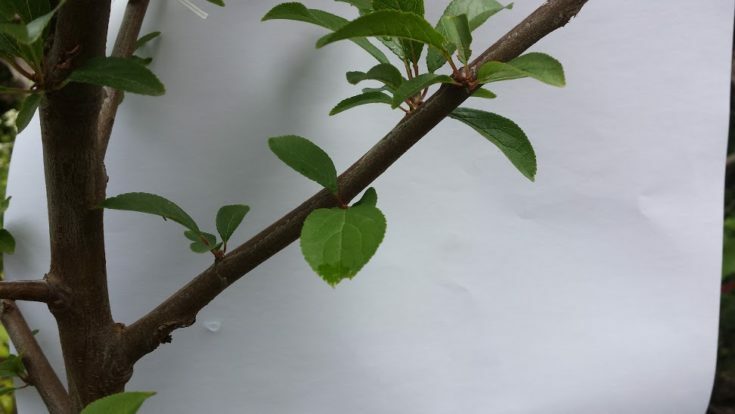 If you do see these branches, snip them off while they are young to prevent problems later on. Never use wooden containers (unless it is lined with plastic) for your fruit tree. Wood likes to absorb the moisture from the soil, leaving the soil dry and free from important nutrients. Likewise, never use Terra Cotta pots either; these soak up water and have the tendency of cracking and splitting when under too much pressure. Training a trees’ roots is very important as it will make them used to boundaries, and the ability to grow with limited space. To train your tree this way, you will need multiple pots. Once your tree is root­bound (meaning the roots have spread all over the pot and are starting to come out of the drainage holes), you will need to wait a month and then re­pot into a bigger pot. Once the roots are root­bound again in the second pot, re­pot it again, and then again, and again until you end up with the best pot size. The pots may be just a couple liters larger than the one before, the size difference doesn’t really matter as long as the new pot is larger than the one before. Many people think that trees require Tree Soil even when the tree is to be grown in a pot. This is not true. Instead, use potting soil. Potting soil is light and fluffy, and will not put too much pressure on the roots. Since potting soil is a bit too fluffy, make sure to somehow compact the soil. You can water it down as a way to do this, or simply use your hands to press it down. You are probably used to poking holes at the bottom of your flower pots, right? We all know that proper drainage is essential for container gardening. It is even more necessary for growing fruit trees in pots. Unlike other plants, most fruit trees grow better in very dry soil than in very wet soil. They hate wet soil. In fact, more than 50% of fruit tree diseases are caused by overly­wet soil. So, it is very important that excess water is able to freely flow out of the pot. For a container that has a base circumference of 20 inches, drill about 5 1cm drainage holes. Nitrogen in fertilizers makes leaves and new stems grow faster and better, thus less of the tree’s energy is spent on producing fruit. So when choosing a fertilizer, don’t choose one with too much nitrogen. A water­ soluble fertilizer is the best. Fertilizer spikes are not recommended for fruit trees in containers unless written otherwise on the product. Never fertilize in late fall or winter months. The tree does not want to produce any new growth during this season so you should not force it. Fertilizing in fall and winter could mess up the trees winter­state and cause problems. Plant some shallow­root, ground­cover flowers as well. This will act as mulch and add a bit of character to the pot! Space will never be an issue again in growing fruit trees. Growing fruit trees is now very much doable and you don’t need a huge space to grow fruit trees, you just need containers and the proper care. Pick, grow, harvest, and enjoy with your beautiful fruit tree in a container! Thanks for checking our post for secrets to growing fruit trees in containers! Did you find it helpful and interesting? Let us know in the comments below. Want to learn how use recyclable material into a planter? Check out here DIY Bottle Planter From Recyclables, an easy DIY perfect for seed starting! This post was originally published in July 2016 and has been updated for quality and relevancy.